Even in today's industrialized world, we have insecurity about the future, which leads to increased pressure for disintegration. 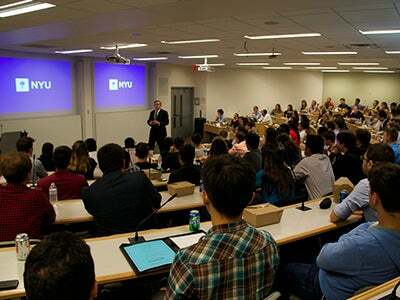 The Right Honourable Gordon Brown, former Prime Minister of the United Kingdom and NYU’s first Distinguished Global Leader-in-Residence, presented a talk entitled "Global Economic Problems, Global Solutions," to more than 100 graduate students from NYU’s Stern School of Business, Wagner School of Public Service and the School of Arts & Science this fall. According to Brown, the current demand for change appears to be coming from every corner of the globe. As examples, he pointed to recent secessionist, protectionist and immigration movements across Europe, North America, Africa and the Middle East. 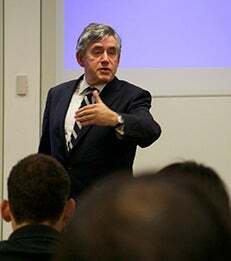 “Even in today's industrialized world,” he explained, “we have insecurity about the future, which leads to increased pressure for disintegration.” Calling these trends a paradox, Brown stressed the need for greater cooperation among countries to tackle the world’s biggest problems. Climate change is one such “modern-day problem,” explained Brown, in that it has worldwide implications, it requires a global commitment and coordination, and citizens are demanding attention. Brown reflected on the United Nations’ 2009 summit in Copenhagen, which convened nearly 200 countries to discuss the issues surrounding climate change, including poverty, long-term financing and transparency. A distinct lack of a decision-making process was a key stumbling block to the summit’s efficacy, observed Brown, who lamented that world leaders left Denmark without a treaty. Similarly, explained Brown, the G20 talks aimed to restore confidence in markets following the recession and subsequent collapse of world trade in 2009-2010. History shows, however, that their effects were short lived. Coordination broke down, and as a result, nearly six years later, the global economy is growing at record-low rates and living standards have stalled for more than 20 years.